High fashion and hip hop have been inextricably entwined since the early 90s, when Puff, Biggie, and Lil’ Kim dominated the rap scene – Dom Perignon in hand, dripping in diamonds and swathed in Fendi furs, Louis Vuitton logos and full Gucci looks. At the top of the list when it came to luxury labels, though, was Versace. The brand’s ostentatious, uber-glam aesthetic – the Baroque prints, the gold detailing – came to define both a generation of rappers and an era when more was most definitely more. Someone who had a particular affinity for Versace was Tupac Shakur, who not only rocked the Italian label’s looks and rapped about it on a regular basis (see: “Hit ‘Em Up Style” if you’re looking for an example), but also forged a close friendship with its founder, Gianni. 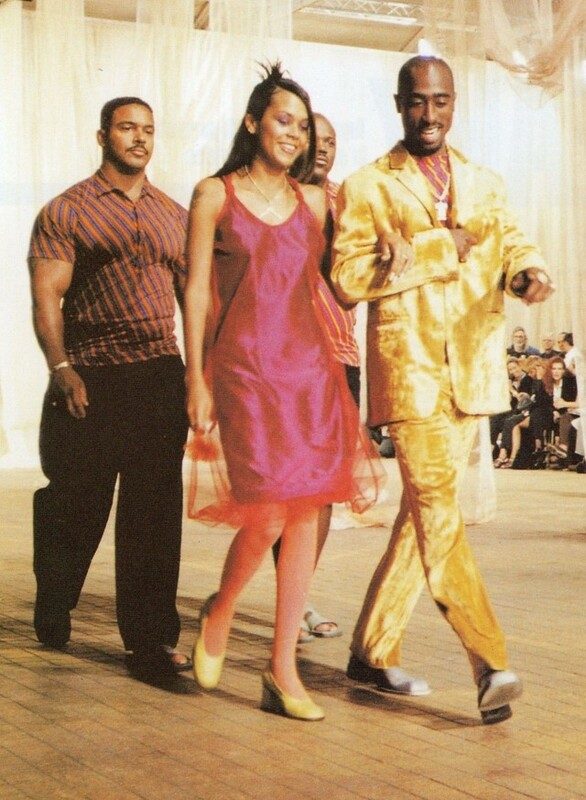 It makes sense, then, that the designer cast ‘Pac in his 1996 menswear show, having described him as “the most beautiful man in the world”. It wasn’t a straightforward up and down the runway, though. The artist took to the Milan catwalk wearing a gold velvet suit – arm in arm with then-girlfriend Kidada Jones and flanked by two hench-to-say-the-least bodyguards – before performing “California Love” to the assembled audience of industry insiders and press. It was the first and last time Shakur made an appearance on the fashion stage: just a few months later, in September 1996, he was gunned down in Las Vegas, leaving fans devastated. Of course, Tupac isn’t the only surprising figure to make an appearance on the catwalk. 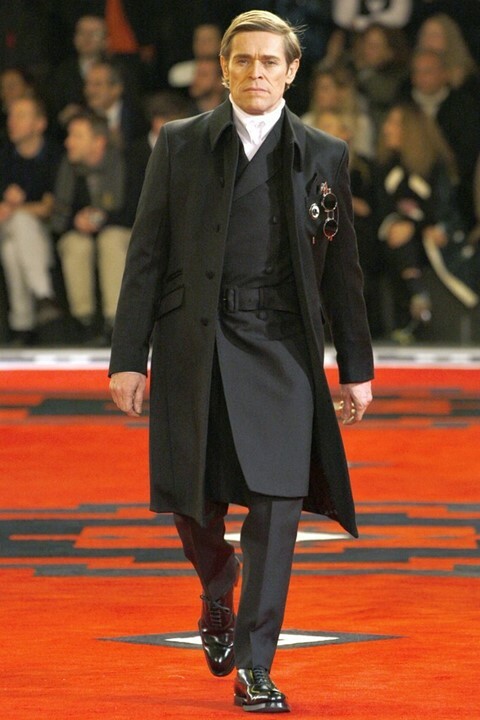 Before Donatella debuts her SS19 menswear collection in Milan tonight, we take a look back at a series of runway cameos from some very recognisable names. There are few of us that would consider pieces from Comme des Garçons Issey Miyake and Yohji Yamamoto suitable painting attire. Not so Jean-Michel Basquiat. Donning an array of designer suits while daubing his signature markings on a series of canvases, close friend and style writer Glenn O’Brien once remarked the artist “treated Armani like Dickies and Versace like Sears”. The distinctive way in which Basquiat used his clothing to communicate and accentuate his artistic persona evidently struck a chord with Rei Kawakubo, and 1987 the grand doyenne of avant-garde fashion invited him to walk in her SS88 Comme des Garçons show. 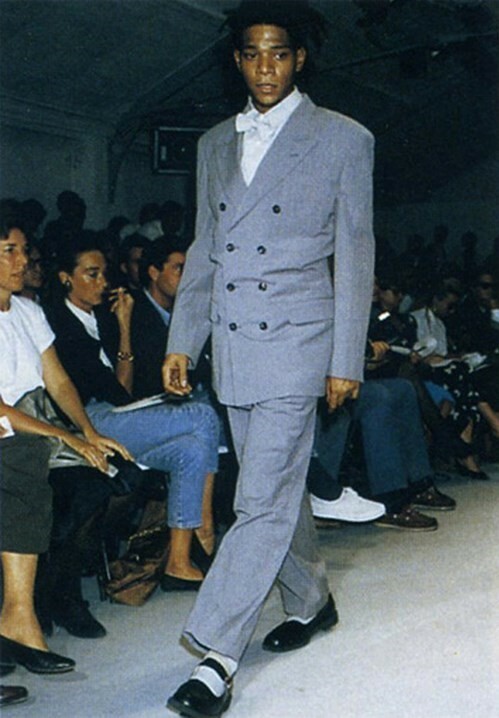 Taking to the Paris catwalk in a grey double-breasted suit jacket with wide shoulders, slightly cropped trousers and a white bow-tie, the look was finished with a pair of black Mary Jane buckled shoes – and not a paint smudge in sight. What a show: in 2012, Miuccia sent not just one or two familiar faces down the runway, but a whole procession of them. Less like a fashion show and more like a role call at the Sundance Film Festival or Golden Globes (which happened to take place the same day), acting heavyweights Willem Dafoe, Gary Oldman, Tim Roth and Adrien Brody were joined by relative newcomers including Jamie Bell as they modelled a series of the tailored shirts, mourning-style coats and slim-cut trousers that featured in Prada's AW12 collection. The show was demonstrative of Miuccia's tendency for casting offbeat personalities in her shows and campaigns; with Joaquin Phoenix, Harvey Keitel, Christoph Waltz and, director Pedro Almodovar (to name but a few) all making up the Italian brand's modelling alumni. Just a few years after Jean-Michel Basquiat's appearance on the Comme des Garçons catwalk, Rei Kawakubo invited Dennis Hopper to walk in her AW91 show. 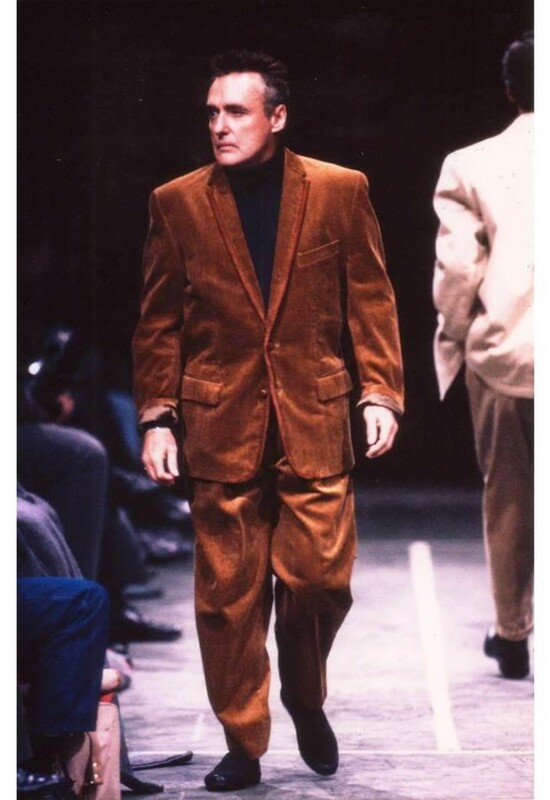 Appearing in two of the minimal suits that were the Japanese designer's signature in the early 90s (one in black, one in brown), the actor, director, and photographer coincidentally went on to star in Basquiat – the 1996 film charting the artist's meteoric rise to fame – as his manager Bruce Bischofberger. If you haven't seen it, add it to your must-watch list: it also stars Christopher Walken, Courtney Love and David Bowie as Andy Warhol. 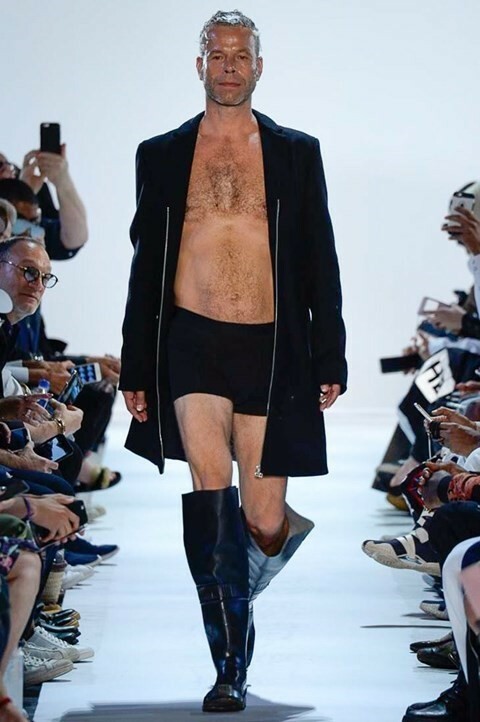 Following in the footsteps of A$AP Rocky, Arca and Hari Nef, revered German photographer Wolfgang Tillmans stormed Hood By Air's catwalk in late 2016, as he appeared in a black tailored coat, briefs and thigh-high leather boots for SS17. Both Turner prize-winner Tillmans and HBA's Creative Director Shayne Oliver share an affinity for the subversive which may explain the casting; both explore sexuality, politics and contemporary youth culture throughout their work, challenging preconceived ideas of masculinity and pushing the boundaries of what could be considered art within their respective practices. Throughout the history of his career, Raf Simons’ work has been ingrained with subcultural references and reverent nods to underground musical scenes: take his extensive archive of New Order and Joy Division-inspired pieces, or the garments that bear hallmarks of the rave, gabber, and new wave movements of the late 80s and 90s for example. He also has something of a soft spot for German synth-pop band Kraftwerk, as was revealed back in AW98. The Belgian iconoclast paid homage to the foursome by not only creating a collection inspired by the cover of their 1978 album Man Machine – all slim, red button-down shirts, and skinny black ties and trousers – he also cast members of the band as models in the show’s line-up, and sent them out to their own track: 1974 classic “Autobahn”. 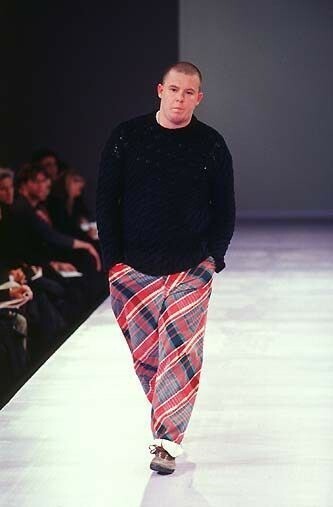 In 1997, after having relocated to Paris to take the helm of revered French fashion house Givenchy, Alexander McQueen took time out of his unrelenting schedule (more on that here) to make a surprising appearance as part of Comme des Garçons’ Homme Plus AW97 show. But then, when Rei Kawakubo calls and tells you she requires your presence, we imagine it must be pretty difficult to decline. Taking to the runway looking decidedly fresh-faced, the legendary designer wore an understated black sweater, wide-legged plaid trousers, and sneakers. 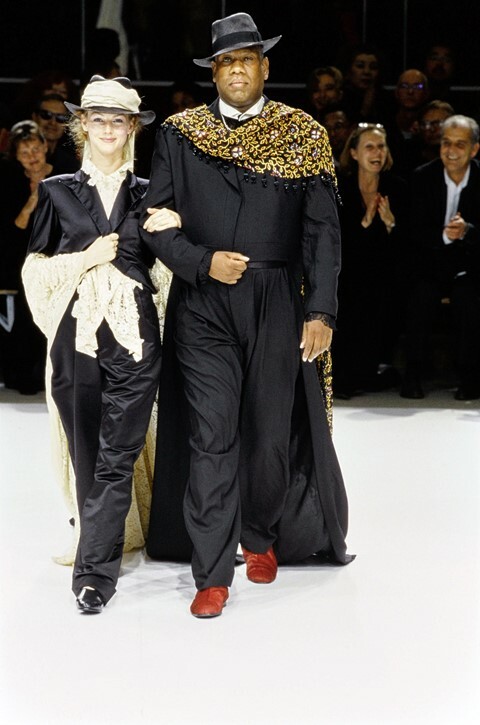 As part of the second of two wedding-themed shows presented in 1998, both of which featured a succession of offbeat reinterpretations of classic bridal gowns, Japanese provocateur Yohji Yamamoto invited an unexpected guest to join his models on the runway: ex-Vogue editor Andre Leon Talley. As the girls made their way around the space, they cast off layers of their looks to reveal further garments underneath as they went. Talley appeared at the end of the show, arm in arm with a model, and wearing a black silk suit, a white button-down shirt, and – of course – a leopard print, fringed shawl that trailed out behind him as he walked.